We don't have any trips to Baltic States at the moment . 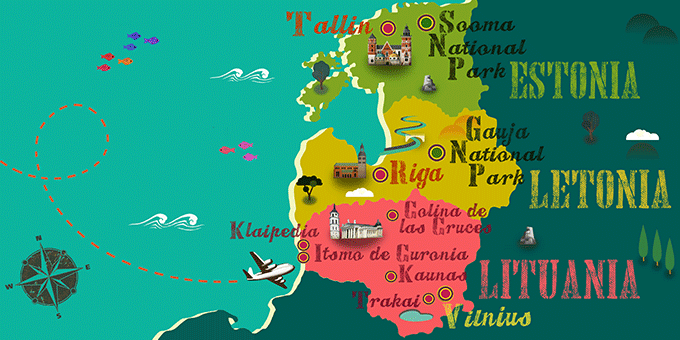 Since Estonia, Latvia and Lithuania became independent from the USSR, these small countries on the Baltic Sea have become very popular tourist destinations. One reason to travel to the Baltic Republics is undoubtedly to experience the grand cities of Tallinn, Riga or Vilna, its three capitals. All of them are World Heritage Sites for their historical treasures and architecture. It is also impossible to miss Estonia and its national parks. With its endless forests, Latvia also tempts us to make a route through the country, while Lithuania also grabs our attention with magical places such as Lake Trakai and the Hill of Crosses. A trip to the Baltic countries of Estonia, Latvia and Lithuania is to get to know a world that for years was forbidden in the eyes of many. EU citizens do not require a visa to enter the country. A third of the population also speak Russian. If Baltic States has caught your attention, leave us your number so we can call you to discuss the voyage that awaits you.